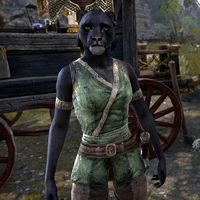 Gnaws-on-Tail is a Baandari Khajiit looking for her partner, Skyward-Eyes who in a fit of panic, ran into the ruins of Arlimahera's Grip looking for a way to escape Bangkorai. The duo's main business these days is the sale of "Tamriel is Doomed" emergency kits, with Gnaws-on-Tail on sales and Skyward-Eyes as the doomsayer convincing people to buy. Gnaws-on-Tail freely admits it's a scam but Skyward-Eyes tends to "get spooked by her own stories". "Good meeting, walker! Do you have a moment? My business partner is in trouble and this one could use some aid." 'My partner, Skyward-Eyes, darted into these ruins seeking some ancient magical travel device to get her out of Bangkorai." "Imperial invaders perhaps, giant chains dropping from the sky—or maybe she just go spooked by a crow. Not sure. Anyway, she ran straight through those Daedra, and this one isn't going after that one. Will you help get her to safety?" "Just make sure Skyward-Eyes is safe. This one is at her wit's end. "This one will try to satisfy your curiosity." What do you two sell? "We sell "Tamriel is Doomed" survival kits. These are packs of basic survival supplies like dried fruit and bandages. I manage the money, Skyward-Eyes is out Prophet of Doom, and we scare enough locals to make a healthy income." "Thank you. It works pretty well. Or at least until Skyward-Eyes gets spooked by one of her own stories and bolts for the tall timber. Then we have inconvenience." Why did Skyward-Eyes run off? "Because she is kin to Sheggorath! Sure, her terrified ravings drive our sales but at some point she always heads for the horizon. We have to go after her, and end up somewhere in East Flea-Bite hiding from imaginary flying Slaughterfish or somesuch." Why did you come here to Arlimahera's Grip? "We didn't. At least I didn't. We set up shop in Martyr's Crossing, but the Imperials wrecked the place. Skyward-Eyes insisted we could escape through here. Jone and Jode told her all about it. Ziss!" Isn't Arlimahera's Grip just a ruin? "She said something about an ancient Redguard travel altar that the shaveskins would use to escape. Sounds like skooma dreams to me. If you find her, you can ask her." After helping Skyward-Eyes escape via teleportation, you can report back to Gnaws-on-Tail with the news. "SO where's Skyward-Eyes? Did the Daedra get her, or did she escape?" Does Reaper's March count as an escape? "Reaper's March? You're pulling this one's hind leg! Did she say where in—no, wait of course she didn't. Well, this one thanks you anyway. To expect a better result would be folly." Speaking to her again after completing We Live In Fear reveals that these sort of shenanigans are nothing new. "This one can't believe we have to go all with way back to Reaper's March. The last time we were in Arenthia, Skyward-Eyes hitched a ride on a cargo ship and ended up in Senchal!" This page was last modified on 7 October 2018, at 16:58.